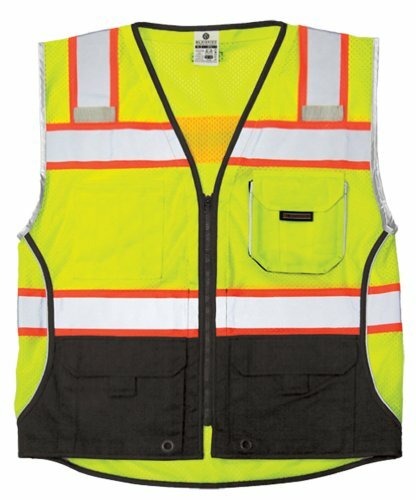 This ML Kishigo Enhanced Visibility Multi-Pocket Mesh Vest features a zip-front, 2in. strips of high-performance silver reflective material, and 3in. 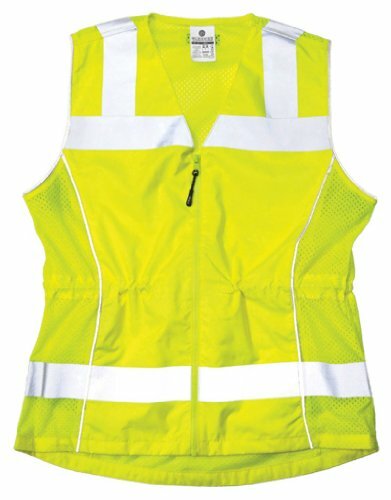 strips of hi-vis contrasting lime to help maintain visibility on the job. Front exterior includes left and right chest mic tabs, 2 lapel grommets and 4 pockets, including 2 cargo pockets with flaps and grommets for flagging tape. Interior includes 2 pockets, for a total of 6 pockets overall, so you have plenty of space for your gear. ML Kishigo multi-pocket vest. Ultra-cool 100 percent polyester mesh. Zipper front closure. 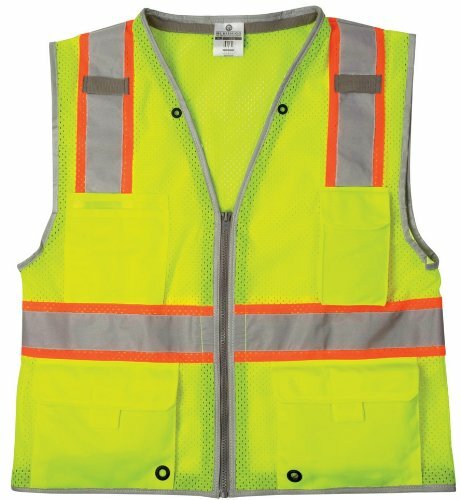 2-inches wide VizLite reflective materials with 3-inches breathable contrasting color. Pockets: two lower outside patch pockets with flaps, right chest 2-tier pencil pocket, left chest radio pocket, two inside patch pockets. ANSI/ISEA 107 class 2 compliant. Size: extra large. Lime color. 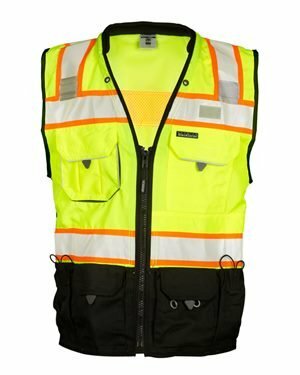 ML Kishigo Enhanced Visibility Multi Pocket Black Mesh Vest (L/XL) With over 40 years on the job, we've made it our mission to design and manufacture high quality clothing that you can depend on to keep you safe and comfortable on the job site. We pride ourselves on our high standards and focus on the details and safety compliance standards so you don't have to. When you buy ML Kishigo work wear, you'll gain a new tool that makes your job easier. Pockets: Two lower outside cargo pockets with adjustable flaps. Right chest 2-tier pencil pockets. Left chest radio pocket. Two inside patch pockets. 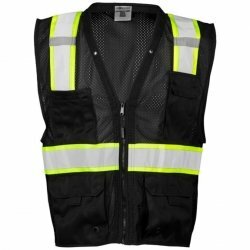 ML Kishigo Ultra-Cool polyester mesh black series heavy duty vest. Zipper front closure with durable webbing reinforcement. 2-inches Wide silver reflective materials with 3-inches breathable contrasting color. 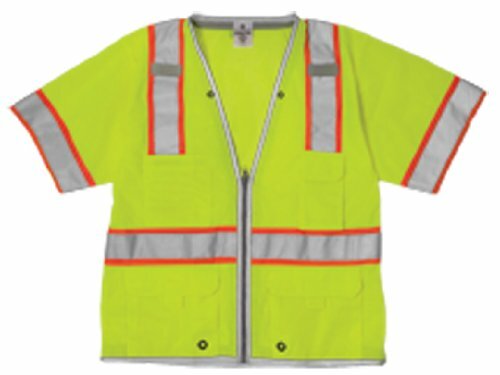 Reflective trim around arms and piping down sides for added low light visibility. Black sides provides contrast and adds a sporty look. 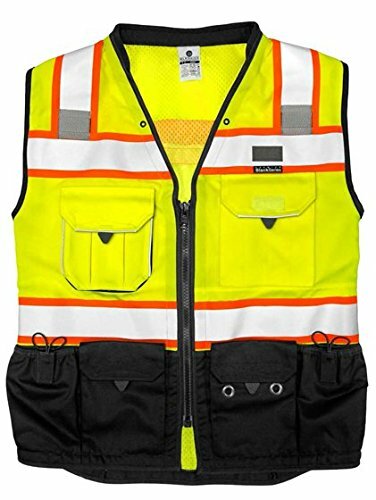 Pockets: two lower outside cargo pockets with adjustable flaps and grommets, right chest 2-tier pencil pocket, left chest heavy duty gusseted radio/utility pocket with reflective piping, two inside patch pockets. Trim and zipper color match the fabric on medium only. ANSI/ISEA 107 class 2 compliant. Black series are built for maximum durability, greater functionality, improved visibility and unexpected style, Black series raises the bar on how quality safety apparel should look and feel. 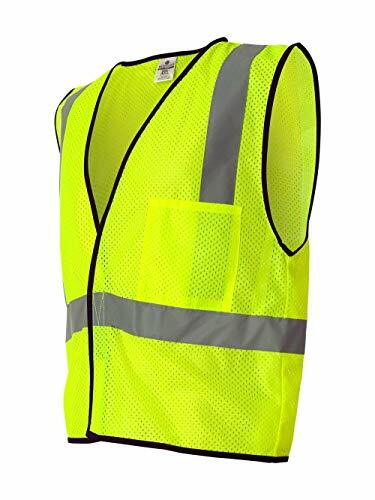 These are not your neighborhood crossing guard's vests. These are built for the serious worker. Size: large. Orange color. 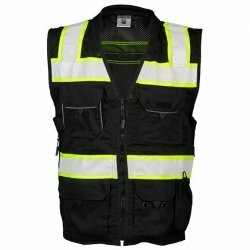 ML Kishigo Ultra-Cool polyester mesh black series heavy duty vest. Zipper front closure with durable webbing reinforcement. 2-inches Wide silver reflective materials with 3-inches breathable contrasting color. 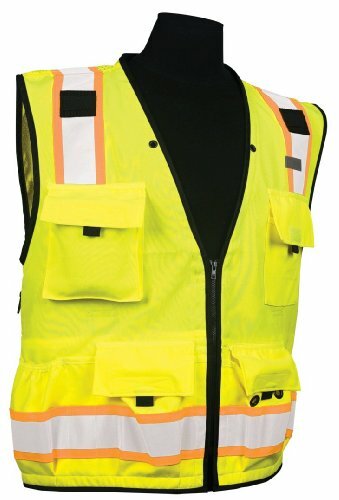 Reflective trim around arms and piping down sides for added low light visibility. Black sides provides contrast and adds a sporty look. Pockets: two lower outside cargo pockets with adjustable flaps and grommets, right chest 2-tier pencil pocket, left chest heavy duty gusseted radio/utility pocket with reflective piping, two inside patch pockets. Trim and zipper color match the fabric on medium only. ANSI/ISEA 107 class 2 compliant. Black series are built for maximum durability, greater functionality, improved visibility and unexpected style, Black series raises the bar on how quality safety apparel should look and feel. 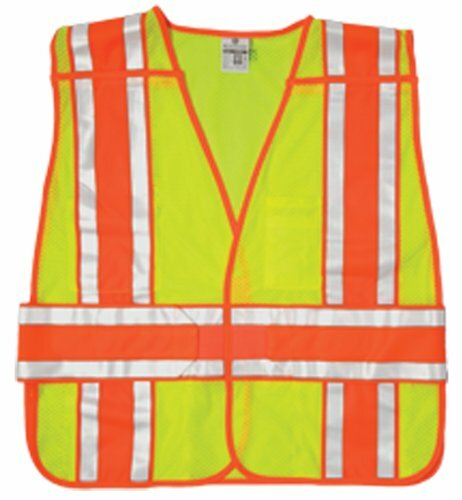 These are not your neighborhood crossing guard's vests. These are built for the serious worker. Size: 3X-large. Lime color. 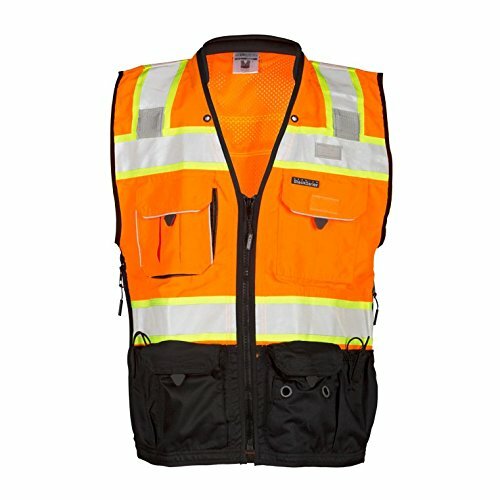 ML Kishigo multi-pocket vest. Ultra-cool 100 percent polyester mesh. Zipper front closure. 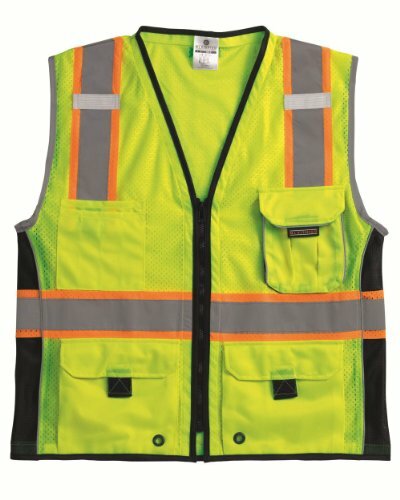 2-inches wide VizLite reflective materials with 3-inches breathable contrasting color. Pockets: two lower outside patch pockets with flaps, right chest 2-tier pencil pocket, left chest radio pocket, two inside patch pockets. ANSI/ISEA 107 class 2 compliant. Size: extra large. Orange color. ML Kishigo Ultra-Cool mesh 3-pocket vest. Made of 100 percent polyester material. Zipper front closure. 2" Wide VizLite reflective material. Pockets: outside left chest radio pocket with velcro tab, inside right chest 2-tier 4-division pencil pocket, lower inside left patch pocket. ANSI/ISEA 107 class 2 compliant. Size: medium. Orange color. ML Kishigo contrasting vest. Ultra-Cool 100 percent polyester mesh. Zipper front closure. 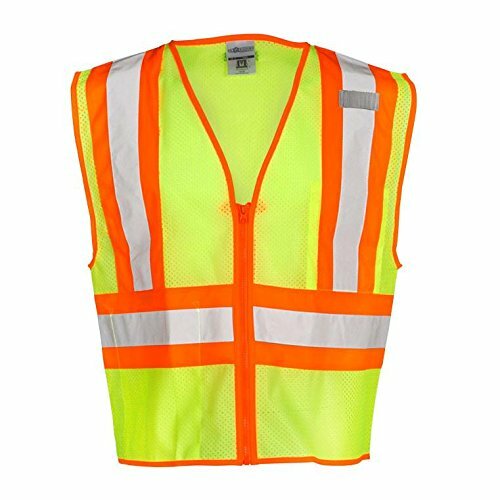 2-inches wide VizLite reflective materials with 4-1/2-inches contrasting color. Pockets: inside left chest 2-tier 4-division pencil pocket, lower right inside patch pocket. ANSI/ISEA 107 class 2 compliant. Size: medium. Lime color. 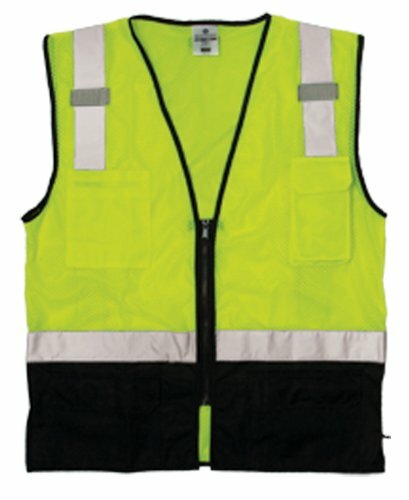 ML Kishigo economy series 1-pocket mesh vest. Comfortable mesh material. 4" Velcro front closure. 2" Silver reflective material. Left chest pocket. ANSI/ISEA 107 class 2 compliant. Fits large and extra large. Orange color. 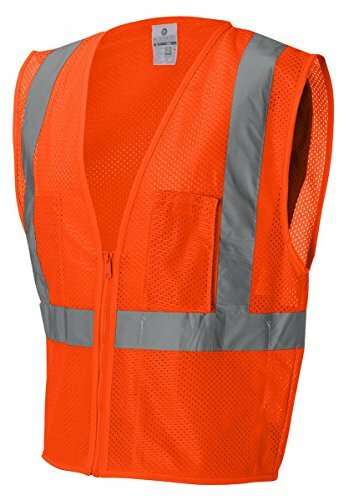 ML Kishigo brilliant series heavy duty vest is made up of 100 percent polyester material mesh with solid pockets. Brilliant trim reflective edging considerably improves low light visibility. Comes with zipper front closure. It also consists of 2-inches wide silver reflective material with 3-inches contrasting mesh. There is left and right chest mic tabs. Pocket includes: outside right chest 2-tier pencil pocket, outside left chest radio pocket, inside lower patch pockets, two lower outside cargo pockets with grommets and adjustable flaps. Ultra-cool mesh. Brilliant series have features, day visibility and night visibility. In full daylight enhances durability, usability and comfort. In lowlight conditions, being seen can mean the difference between life and death. 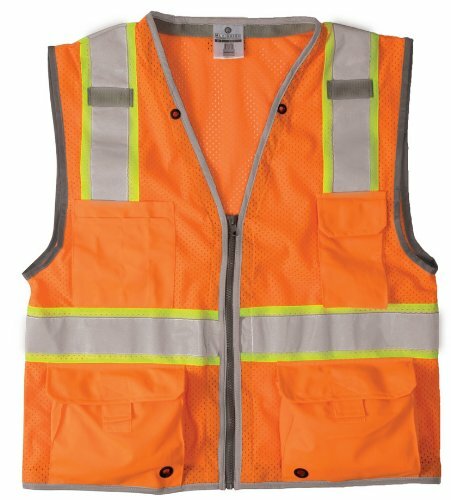 Brilliant series trim provides instant differentiation of the human form from the work zone. The thin trim lines radiate quick human movement which dramatically enhances visibility. ANSI/ISEA 107 Class 3 Compliant. Orange color. Size: large. 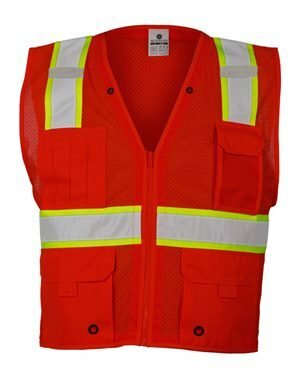 ML Kishigo brilliant series heavy duty vest. Ultra-Cool 100 percent polyester mesh. Zipper front closure with durable webbing reinforcement. Brilliant trim reflective edging considerably improves low light visibility. 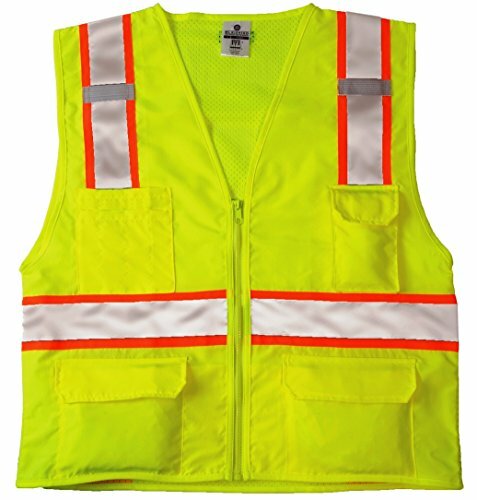 2-inches Wide VizLite reflective materials with 3-inches breathable contrasting color. Pockets: two lower outside cargo pockets with adjustable flaps, right chest 2-tier pencil pockets, left chest radio pocket, two inside patch pockets. ANSI/ISEA 107 Class 2 Compliant. Brilliant series have features, day visibility and night visibility. In full daylight enhances durability, usability and comfort. In lowlight conditions, being seen can mean the difference between life and death. 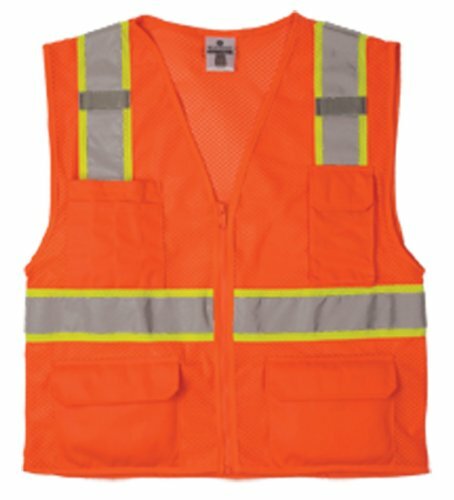 Brilliant series trim provides instant differentiation of the human form from the work zone. The thin trim lines radiate quick human movement which dramatically enhances visibility. Size: 2X-large. Lime color. ML Kishigo breakaway vest. Ultra-Cool 100 percent polyester mesh. Velcro breakaway shoulders, sides and front closure. 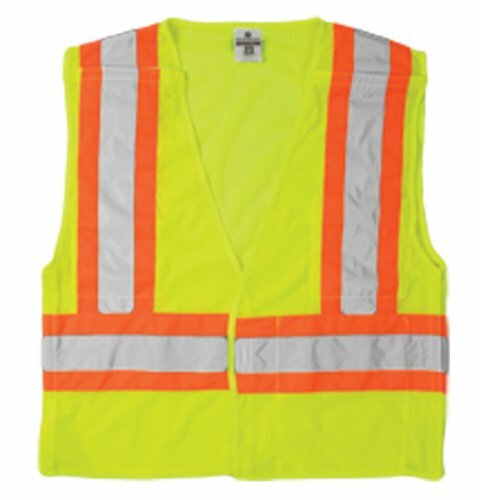 2-inches wide VizLite reflective materials with 4-1/2"-inches contrasting color. Pockets: inside 2-tier 4-division pencil pocket, inside lower left patch pocket, inside right cell phone pocket. 5-Point breakaway. ANSI/ISEA 107 class 2 compliant. Size: extra large. Lime color. 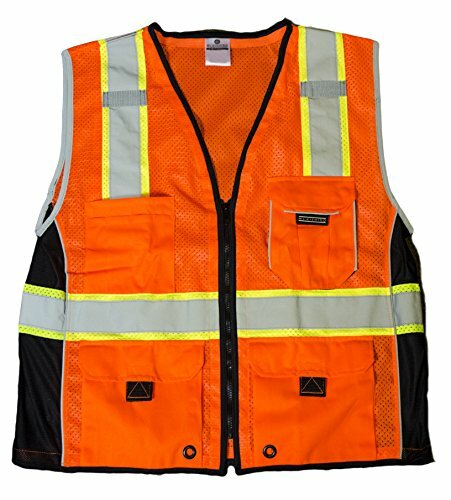 ML Kishigo brilliant series heavy duty vest is made up of 100 percent polyester material mesh with solid pockets. Brilliant trim reflective edging considerably improves low light visibility. Comes with zipper front closure. It also consists of 2-inches wide silver reflective material with 3-inches contrasting mesh. There is left and right chest mic tabs. 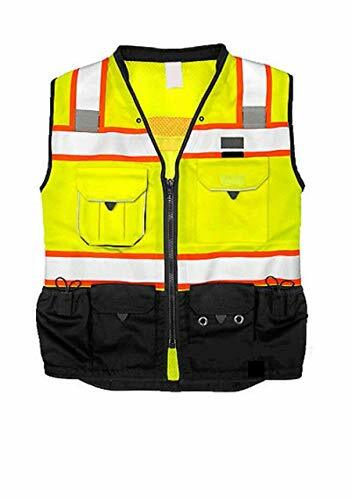 Pocket includes: outside right chest 2-tier pencil pocket, outside left chest radio pocket, inside lower patch pockets, two lower outside cargo pockets with grommets and adjustable flaps. Ultra-cool mesh. Brilliant series have features, day visibility and night visibility. In full daylight enhances durability, usability and comfort. In lowlight conditions, being seen can mean the difference between life and death. 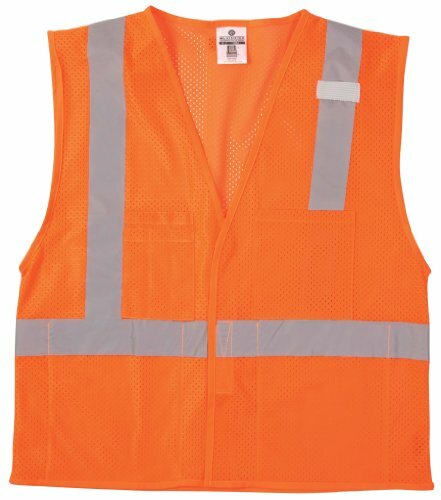 Brilliant series trim provides instant differentiation of the human form from the work zone. The thin trim lines radiate quick human movement which dramatically enhances visibility. ANSI/ISEA 107 Class 3 Compliant. Lime color. Size: 2X-large. 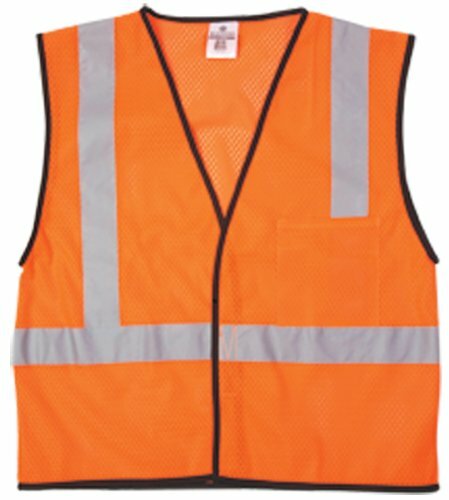 Caltrans Series High Performance Surveyors Vests. ML Kishigo Ultra-Cool black bottom vest. Made of 100 percent polyester material. Zipper front closure. 2-inches wide silver reflective. Solid black polyester on lower front. 2-inches wide silver reflective material. Left and right chest mic tabs. Two lower front solid patch pockets with flaps. Left chest radio pocket. Right chest 2-tier pocket. Two large lower inside pockets. ANSI/ISEA 107 Class 2 Compliant. Lime/black color. Fits large and extra large. ML Kishigo Ultra-Cool polyester mesh reflexite vest. Made of 100 percent polyester material mesh. Zipper front closure. 2-inches wide prismatic reflective material. Outside left chest 2-tier 3-division pencil pocket. Inside lower right patch pocket. ANSI/ISEA 107 class 2 compliant. Orange color. Size: large. 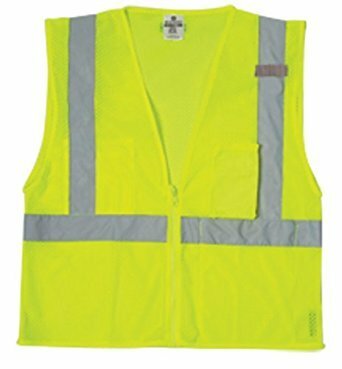 ML Kishigo brilliant series heavy duty vest. Ultra-Cool 100 percent polyester mesh. Zipper front closure with durable webbing reinforcement. Brilliant trim reflective edging considerably improves low light visibility. 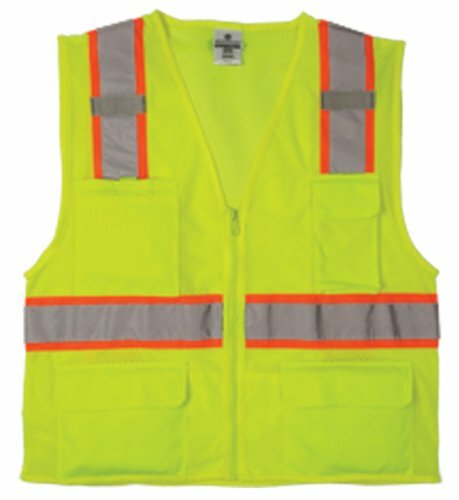 2-inches Wide VizLite reflective materials with 3-inches breathable contrasting color. Pockets: two lower outside cargo pockets with adjustable flaps, right chest 2-tier pencil pockets, left chest radio pocket, two inside patch pockets. ANSI/ISEA 107 Class 2 Compliant. Brilliant series have features, day visibility and night visibility. In full daylight enhances durability, usability and comfort. In lowlight conditions, being seen can mean the difference between life and death. 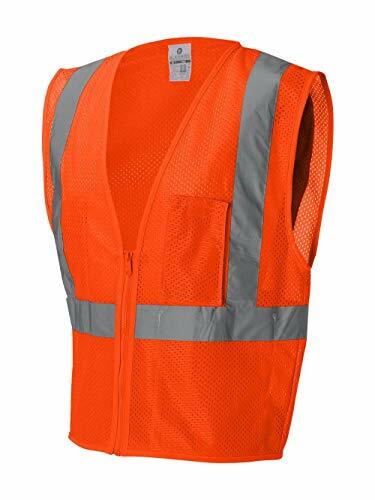 Brilliant series trim provides instant differentiation of the human form from the work zone. The thin trim lines radiate quick human movement which dramatically enhances visibility. Size: large. Orange color. 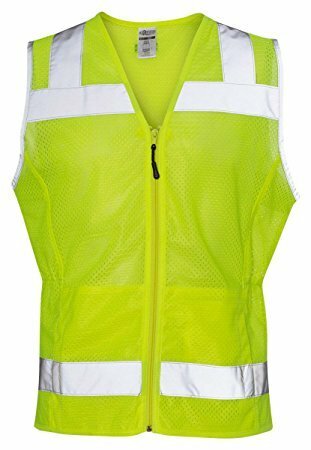 ML Kishigo economy series 1-pocket mesh vest. Comfortable mesh material. 4" Velcro front closure. 2" Silver reflective material. Left chest pocket. ANSI/ISEA 107 class 2 compliant. Fits 2X-large and 3X-large. Lime color. ML Kishigo Ultra-Cool mesh 3-pocket vest. Made of 100 percent polyester material. Zipper front closure. 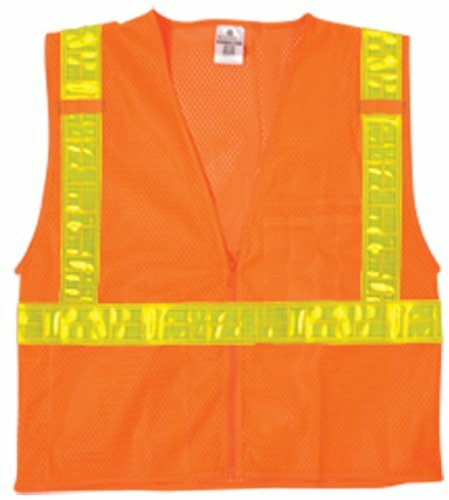 2" Wide VizLite reflective material. Pockets: outside left chest radio pocket with velcro tab, inside right chest 2-tier 4-division pencil pocket, lower inside left patch pocket. ANSI/ISEA 107 class 2 compliant. Size: 2X-large. Lime color. Solid polyester front with mesh back. Heavy duty black bottom and trim to help keep a clean appearance. Zipper front closure reinforced with durable webbing. 2" wide high performance reflective material laminated to 3" contrasting color. Left and right mic tabs. 2 lapel grommets. Padded neck for comfort. Left chest 2-tier pocket with dual function flap that can be help open by hook and loop. Large right gusseted pocket with flap. Outside lower front pockets with flaps, left and right stake pockets, left and right elastic spray paint can pockets. Lower inside right full length zipper pocket with load bearing strap. Lower inside left tablet pocket with load bearing strap. Hidden back pouch with left and right zipper access. ML Kishigo 4-season breakaway vest. Ultra-Cool 100 percent polyester mesh. Velcro front closure. 4-Season adjustability allows for accurate sizing in any weather, even over bulky coats. 5-point breakaway. 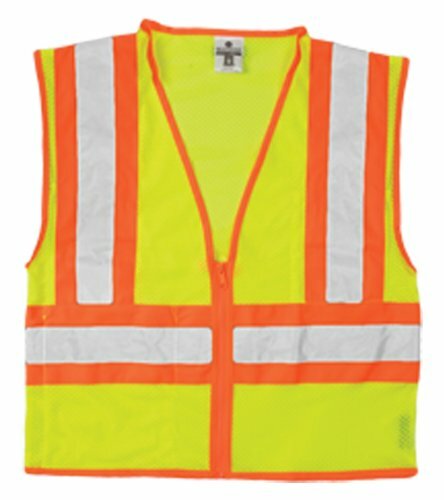 Two 1-inch wide VizLite reflective materials with 4-1/2-inches contrasting color. Pockets: inside 2-tier pencil/cell pocket, two inside lower patch pockets, outside left 2-tier pencil pocket. ANSI/ISEA 107 class 2 compliant. Fits for 2X-large, 3X-large and 4X-large sizes. Lime color. 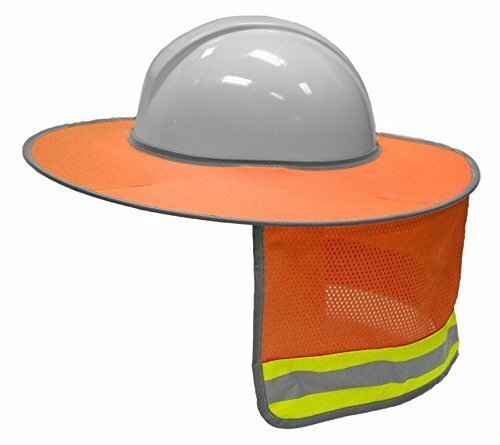 This listing is for 100% Authentic ML Kishigo Brand Hi Viz Hard Hat Sun Shade. BEWARE THAT THE TAG SAYS "ML KISHIGO" IF IT DOES NOT REPORT THE SELLER YOU PURCHASED IT FROM AS SELLING INAUTHENTIC PRODUCT. ML Kishigo Ultra-Cool velcro front multi-pocket vest. Made of 100 percent polyester mesh material. 4" Velcro front closure. 2" Wide VizLite reflective material. 2" Wide VizLite reflective material. Pockets: outside right chest 2-tier pencil pocket, outside left chest patch pocket, inside large lower patch pocket. ANSI/ISEA 107 class 2 compliant. Size: extra large. Orange color. 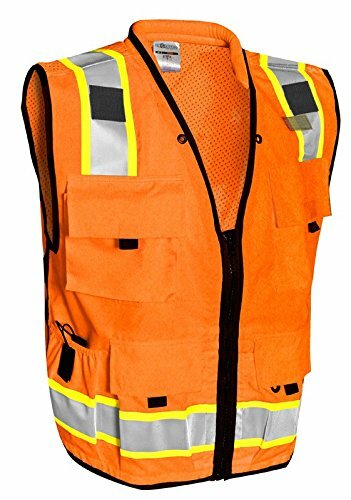 ML Kishigo Class 2 Lime & Orange Surveyors Vest ANSI 107 Features and Specs: Solid polyester front with mesh back. Heavy duty black bottom and trim to help keep a clean appearance. Zipper front closure reinforced with durable webbing. 2" wide high performance reflective material laminated to 3" contrasting color. Left and right mic tabs. 2 lapel grommets. Padded neck for comfort. Pockets: Left chest 2-tier pocket with dual function flap that can be held open by hook & loop. Large right gusseted pocket with flap. Outside lower front pockets with flaps, left and right stake pockets, left and right elastic spray paint can pockets. Lower inside right full length zipper pocket with load-bearing strap. Lower inside left tablet (iPad) pocket with load-bearing strap. Hidden back pouch with left and right zipper access. Constructed with high-performance Brilliant Trim edging. 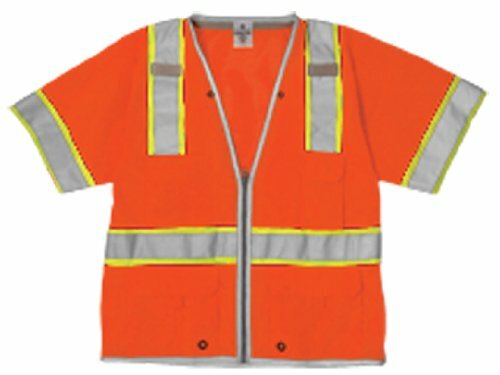 The reflective piping creates an outline of the wearer, vividly portrays the wearerâ€TMs motion, and greatly enhances visibility. 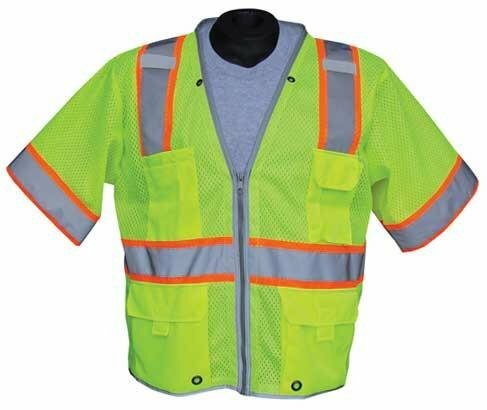 100% polyester mesh is extremely breathable, which helps keep the wearer cool in warm working conditions. Inside right chest 2-tier, 4-division pencil pocket. Outside left chest radio pocket with hook & loop tab. Ultra-Cool 100% polyester mesh. Lower inside left patch pocket. Left chest mic tab. Zipper front closure. 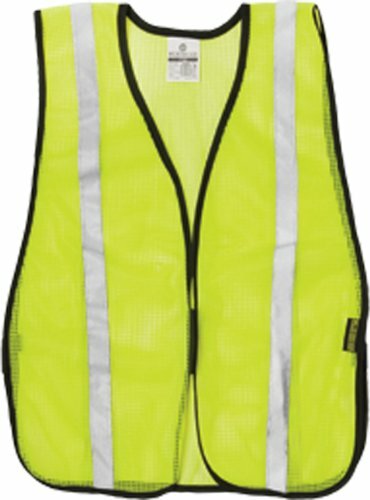 2" wide high performance reflective material. ML Kishigo P Series mesh vest with silver tape. 1" Wide silver reflective stripes. Comfortable cotton trim. 3" Velcro front closure. 3/4" Elastic side closures for universal sizing. Compare prices on Ml Kishigo Mesh at LiveSaler.com – use promo codes and coupons for best offers and deals. We work hard to get you amazing deals and collect all avail hot offers online and represent it in one place for the customers. Now our visitors can leverage benefits of big brands and heavy discounts available for that day and for famous brands. We try to makes comparison shopping easy with Product Reviews, Merchant Ratings, Deal Alerts & Coupons. Find Deals, Compare Prices, Read Reviews & Save Money.